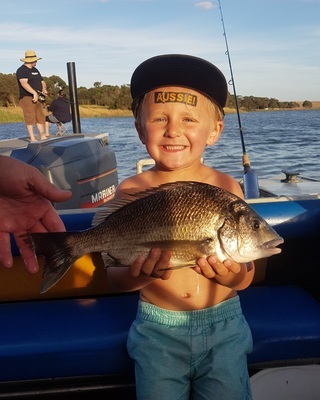 AUSSIE, AUSSIE, AUSSIE: Asher Craig with a Hopkins River bream he caught while fishing with dad Brody. Kingfish were again the hot topic this week, with huge salmon providing equal amounts of entertainment. Offshore from Point Lonsdale to Barwon Heads was the place to be, with great numbers of kings willing to take baits like live slimy mackerel or squid fished deep. Casting lures also accounted for a number of fish, especially stick baits, although trolled squid skirts were a favourite too. The salmon were very thick through The Rip and also offshore. Fish as big as 4kg fell to jigs cast into schools of feeding fish, although trolling small white squid skirts continued to produce results. The great salmon fishing wasn’t just restricted to anglers with boats. Mitch Knox fished 13th Beach over the weekend and had a ball using pilchard and squid on a paternoster rig, catching a number of quality salmon on double hook-ups as schools moved along the shoreline. Most beaches and rock ledges between Point Lonsdale and Lorne should be would worth a visit for salmon at the moment. Pinkies to 45cm were thick throughout Corio Bay, with the area from the edge of the channel at Clifton Springs right through to the Corio Quay producing fish. A light berley will hold them in the area, while bluebait and pilchard are good baits, although casting soft plastics like the Gulp turtleback worm is also highly productive and should account for flathead bycatches as well. Both the Glenelg River at Nelson and Hopkins River at Warrnambool were popular destinations for anglers willing to make the drive in search of mulloway to 80cm, along with bream and estuary perch. The mulloway at both rivers have come on the bite over the last few weeks and will respond well to live mullet, pilchard or squid bait or soft plastics and diving lures. Lake Bullen Merri produced a number of Chinook salmon to 1.5kg over the past week for anglers using down riggers to get lures like the Rapala F7 and F9 into the strike zone. Baits like lightly weighted pilchard fillets used in conjunction with a berley of chopped pilchard scraps proved effective.